Hopes were once high that Myanmar’s transition to semi-civilian government in 2011 would be accompanied by the settlement of its decades-old conflicts with its ethnic minorities. However, many of the country’s insurgencies have escalated since then, plunging the north back into renewed civil conflict. As things currently stand, government forces are battling various ethnic armed groups – including Kachin, Kokang, and Palaung movements – resulting in heavy losses on both sides and the displacement of up to 200,000 civilians in Shan and Kachin States. The escalation of conflict seems particularly puzzling because Myanmar’s generals managed to pacify many of the country’s ethno-nationalist insurgencies with ceasefires in the 1990s. These settlements allowed non-state armed groups to not only retain their arms and pockets of territory, but also granted lucrative business concessions. Instead of fighting each other, elites from all sides started to collaborate in exploiting the area’s natural riches. Dubbed “ceasefire capitalism”[i] by some observers, this economic approach to counterinsurgency produced a remarkably stable order. Fast forward several years, however, and an arrangement which once appeared to be working well now lies in tatters. The same insurgency movements that were ostensibly bought off with economic incentives have again taken up arms and resumed calls for greater ethnic minority rights and federalist constitutional amendments. 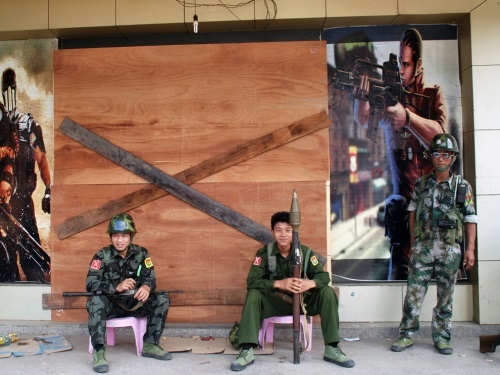 At a recent conference at the London School of Economics, the long-time Myanmar observer Martin Smith called the renewed escalation of these conflicts the most pressing and puzzling question currently facing the Southeast Asian country’s peace process and wider transition. Indeed, Smith followed this up by asking why some ethnic groups have been able to remobilize on such a scale after years of ceasefire and, in some cases, eroding capacities. In the article ‘Ashes of Co-optation: from Armed Group Fragmentation to the Rebuilding of Popular Insurgency’, recently published in Conflict, Security and Development, I seek to answer these questions by analyzing the 2011 breakdown of the 17-year ceasefire between Myanmar’s armed forces and the Kachin Independence Organisation (KIO). [ii] This armistice with one of the country’s oldest and strongest ethnic armed groups was considered ‘integral to the security of northern Burma’. [iii] During the ceasefire years, individual Kachin rebel elites also lined their pockets with the proceeds of the lucrative ceasefire economy, while their organization’s military strength and revolutionary agendas withered away. However, after experiencing near organisational collapse in the early 2000s, the insurgency has found its former resolve, capacity, and popularity. To reveal why the co-optation of Kachin leaders ultimately failed, it is necessary to trace the ripple effects this development sparked within other parts of the movement. While the mutual exploitation of the area’s vast natural resources – including jade, teak, and gold – profited elites on all sides, wealth did not trickle down to local communities. The settlement also left underlying grievances about ethnic and political marginalization unaddressed. Moreover, the ceasefire did not mean an end to insecurity for many Kachin. Unsustainable mining and logging operations brought large-scale environmental degradation, land grabs, and militarization. In its wake a rampant narcotics and HIV/AIDS problem has choked the region’s disillusioned youth. These developments planted the seeds for new grievances within local communities and the Kachin movement, which were now not only directed at the Myanmar government, but also against Kachin leaders. This also provided a fertile ground for an emerging faction of young officers to take over leadership by mobilizing against the old guard’s conciliatory stance. Through the crafting of new alliances and the building of new institutions they managed to remobilise popular insurgency on a large-scale. The insights from the Kachin case are important for understanding the wider dynamics of conflict in Myanmar and beyond. Most importantly, a business and development focused approach to conflict resolution might buy temporary stability, but it cannot buy peace. In Myanmar, the ongoing negotiations for a national ceasefire and an eventual peace agreement between the government and the country’s ethnic armed groups have not yet produced any tangible results mprecisely because of past and present ceasefire experiences.While Naypyidaw still encourages investments in natural resource extraction and large-scale infrastructure projects in ceasefire areas, it continues to bar discussions on the underlying political issues of the country’s ethno-national conflict, most-importantly federal provisions for power-sharing. This can be well observed in southeast Myanmar’s Karen State, which has seen increased in investment in infrastructure and resources since the country’s oldest insurgency movement – the Karen National Union (KNU) – signed a historical and much-applauded armistice in 2012. In Karen State as well as in other marginalized and war-torn communities, it is certainly undeniable that an end to fighting and economic development has helped to improve insecure and impoverished livelihoods. Yet, Myanmar’s unaltered ceasefire politics deliver neither long-term development nor security. On the contrary, the everyday lives of civilians in ceasefire areas are still dominated by militarisation and displacement most often at the hand of army and militia soldiers, who forcefully clear the land for mining operations, agro-businesses and infrastructure. The worrying resemblance of present and past ceasefire experiences, therefore, casts doubt on the success of the ongoing peace process in its current form, despite wider changes in Myanmar’s political landscape since the country initiated political and economic reforms in 2011. Rather than repeating past mistakes, decision-makers from all sides need to learn from the breakdown of previous settlements. Only then can the country’s perpetual cycle of violence be broken. Ashes of Co-optation: From Armed Group Fragmentation to the Rebuilding of Popular Insurgency in Myanmar will be available for six months free and open access exclusively through this link by courtesy of Conflict, Security & Development and Taylor and Francis. David Brenner is a doctoral researcher in International Relations at the London School of Economics and Political Science (LSE). His research focuses on the politics of non-state armed groups and the political economy of borderlands in Myanmar/Burma. He tweets @DavBrenner. [i] Woods, Kevin, 2011. ‘Ceasefire capitalism: military–private partnerships, resource concessions and military–state building in the Burma–China borderlands’. Journal of Peasant Studies 38(4). [ii] Brenner, David, 2015. ‘Ashes of Co-optation: from rebel group fragmentation to the rebuilding of popular insurgency in Myanmar’. Conflict, Security and Development 15(4). [iii] Farrelly, Nicholas, 2012. ‘Ceasing Ceasefire? Kachin Politics Beyond the Stalemate’. In Myanmar’s Transition: Openings, Obstacles and Opportunities. Cheesman, Skidmore and Wilson. Institute of Southeast Asian Studies, Singapore, p.54.